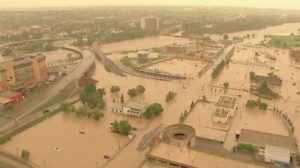 This is a story shared by Paul Battistella, Co-owner/Operator of Battistella Developments and Spokesperson for Flood Free Calgary. Battistella Developments has been developing in Calgary inner-city for almost 40 years. During that time the growth and importance of the centre city has grown dramatically. Up until the last few years a vibrant oil and gas industry was catalyst for growth throughout our City. We benefitted from that as more people moved to Calgary and more people chose to move closer to the core. At the time of the flood we had a building under construction in Kensington and we owned commercial and residential investments in the buildings we had built in the Beltline and the East Village. Everyone in those building was impacted by the flood. We had staff working around the clock to protect the parkade of the building under construction in Kensington. In some ways, we were lucky because if the water had continued the damage to a building without emergency mechanical systems in place could have been catastrophic. 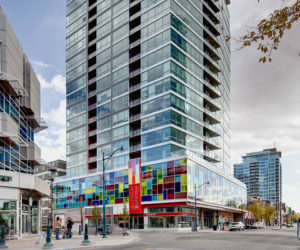 The iconic Colours building in Victoria Park was spared, but buildings across the street lost use of parkades and elevators. In our other buildings, flooded parkades and loss of power for days affected every person and business who occupied them. Resultant damage costs, business interruption, and not being able to access homes were the fall out from that day. Not in our building, but one on First Street across from ours lost its elevator. The occupants of that building had to walk the stairs for over 6 months while they waited for new elevator cabs. That building is 20 storeys tall. Who wants to occupy a building that has that potential risk every single year? Imagine the scenario where downtown core is completely flooded, what would the impact be on our economy? It would probably mean the end of our business if the core was no longer a viable place to house corporate head offices. You only have to look at the devastating effects of the current vacancy crisis in the downtown to understand the importance of the core has to the entire City. A completely flooded downtown would bring the City to its knees. Time passes and people forget, but we do not. We don’t leave the City in June. Right now, like everyone else we are struggling with the economic impact of the ongoing recession. The parallels between pipelines and flood mitigation are ominous. It feels we are living in a time where the greater public good is being held hostage by well funded, politically savvy self-interest groups who are using every tool in the toolbox to serve their own agendas at the expense of the rest of us. At some point, you have to accept what you can’t affect and focus on what you can. That’s why I am actively involved in helping Flood Free Calgary engage the business community of Calgary. Flood mitigation should matter to everyone in this City and I feel businesses should step up and get involved by supporting ongoing upstream projects. Hoping for government to get the job done has not been a very effective strategy.